As a life long Bulldog lover, it deeply depresses me to say that the purebred English Bulldog is truly not doing so well. This fact was hard for me to accept, but the breed as we know it today should no longer be bred with one another--but this certainly does not mean that we will have to say goodbye to our wrinkly, wobbly friends. The traditional English Bulldog is in danger, but the Victorian Bulldog can save them. We are all aware of the health problems existent in the modern day English Bulldog (breathing problems, heart problems, ingrown tails, high risk of infections and cancer, low birthing rate, etc. ), but these are all problems that the Victorian Bulldog breed has partly done away with, and more progress is being made as this breed gets older. Over the past 150 years, due entirely to interbreeding, the English Bulldog has received a flatter face, shorter legs, and more wrinkles. Although these traits are more desirable among Bulldog lovers, the severity of these conditions has put the entirety of this gentle, loving breed at a very high heath risk, and we are to blame. The flatter face is linked to their smaller windpipes, which can cause suffocation and overheating; the short legs have reduced its athletic ability; and the wrinkles, although known as the cutest feature, if not cleaned properly on a daily basis, can cause pain and possibly dangerous infections. Not to mention that the female Bulldog can only successfully birth her pups very few at a time, and only with the help of a caesarean section. Now, what is a Victorian Bulldog? Victorian Bulldogs are a cross between English Bulldogs, Bull Terriers, Bull Mastiffs, and Staffordshire Bull Terriers. 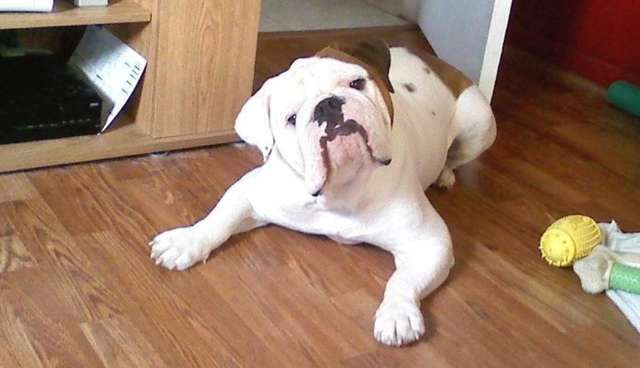 The sole purpose of the breed was to create a healthier Bulldog, which was a major success. Pictured above is my Victorian Bulldog, Frog. As you can see, his wrinkles are much shallower than the typical Bulldog's, but he still has a lovable face that absolutely no animals lover can resist. He's taller and and more narrowly built, can breathe in a healthy manor, does not have a corkscrew tail, and even at his current, somewhat old age has never had infections or even the slightest risk of cancer. There are Victorian Bulldogs all around the parts of the world where Bulldogs are found that are just as healthy as him, and they all have the irresistible features that we fall in love with at first sight. We have always been taught that when we love something, we need to let it go. 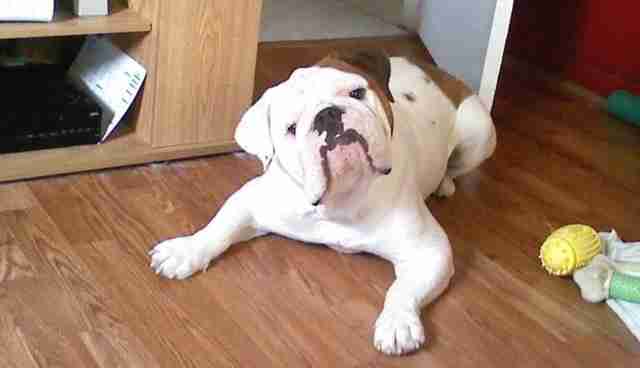 This is usually an enormously difficult task to perform, but necessary, especially in the case of the English Bulldog. Breeders need to take a different approach in the continuation of this proud breed's existence and begin breeding them with other healthy bully breeds in order to guarantee a longer, happier, healthier lifespan. These beautiful animals need to be given back the condition they deserve, especially considering how happy they make their owners.